A vividly told first novel about a WWII soldier who never quite understands what’s going on. When the good but vacuous George Tilson arrives at Omaha Beach (the landings are over), he’s nicknamed “Heck” because that’s his strongest swear word. Heck is from Iowa, 18, and naive, and at once he begins somehow to fall between the cracks, waiting for an assignment that never comes, while others around him are sent off to the front. In scenes only half-believable, he wanders from camp, helps a little French kid who’s injured by a mine, ends up being seduced by the kid’s pretty sister Claire—and, spastically embarrassed, runs away before consummation. Finally attached to a unit and under a night artillery barrage—rivetingly described—Heck discovers that he’s a coward, huddles in his foxhole against orders, and gets separated from his unit. When he then gashes his leg in a fall before finding the others, he’s sent rearward—where, as the seriously wounded suffer and die, he once again somehow goes all but unnoticed. Wandering into town one day, he comes upon Claire’s father—who accuses him of having gotten Claire pregnant. Once again, Heck flees. He’s sent to a unit on harrowing wintertime forest duty, sees death, finds himself once again under heavy fire—and holds his arm up until a bullet pierces it, sending him rearward again. But a ranking fellow soldier sees what he does, and later, after more turns of events, takes the opportunity to punish Heck in an unusual, apropos, and fiercely trying way—one that will hold the reader breathless. Arvin (stories: In the Electric Eden, 2003) opens and closes with references to a real-life Private Eddie D. Slovik, shot for desertion in 1944. Heck’s poor story, subtly enveloped inside Slovik’s, becomes only the more lamentable and sad. 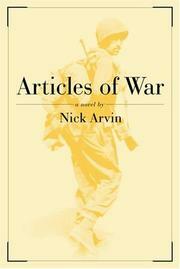 Though stretching credibility at times, Arvin makes a worthy and felt addition to retrospective WWII fiction.